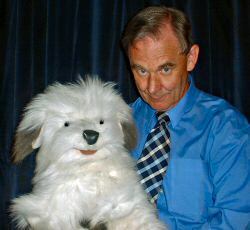 Chris Somerville is the director and resident puppetmaster of The Harlequin Puppet Theatre in Colwyn Bay, North Wales. This is the only permanent puppet theatre ever built in Great Britain and is known throughout the world. 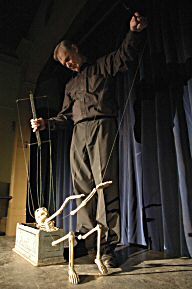 The Harlequin specialises in Marionettes - puppets on strings, and Chris is one of the world's leading manipulators of what is widely recognised as the most difficult type of puppet to animate. The Harlequin presents a variety of productions ranging from Fairy Tales to Puppet Circus and Ballet, delightful entertainment to stimulate young imaginations. The theatre is available for private shows for school groups throughout the year. Widely experienced in all forms of puppetry Chris has created and performed on hundreds of television programmes over many years. 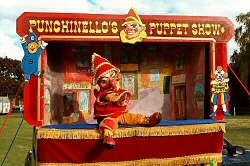 He is also one of Britain's leading Punch & Judy performers and runs the prestigious enthusiasts' website and research facility www.punchandjudy.com. Whatever puppetry project you may have in school Chris can probably supply an exciting and inspiring workshop for the children, drawing on his experience, his vast knowledge and his large collection of puppets from all over the world. Chris will gladly discuss ideas with teachers and offer suggestions to fit in with their classroom needs. He can be contacted by email at Chris@puppets.uk.com or by telephone on 01492 548166. He will be delighted to hear from you.